Have you ever noticed when you walk in to a hotel room you feel an instant sense of relaxation? One of the reasons is probably the lack of clutter in the room. The closet is empty, the drawers are empty and the only thing on the shelf is a lamp. No overflowing closets and drawers. What if a new tradition on Black Friday was to purge instead of shop? 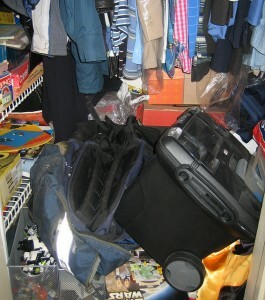 What might you find in your kid’s overflowing closet that is so stuffed they can’t even close the door? Your kid might discover a new toy they forgot about which could keep them entertained this weekend. Think about what you might find in your garage or attic… maybe hundreds of yards of holiday lights. What about your closet? Dig far enough back and you may find an outfit you did not even remember you had that would be perfect for that upcoming holiday party. What if we purged before we shopped? I am guessing we would save a whole lot of money. First we would not buy things we already had. Second we would realize how much stuff we actually have and may be a little more conscious about what we toss in to our cart. Looking back at the years when our kids were younger what we remember now are the experiences we shared together over the holidays, things like ice skating at the Embarcadero in San Francisco, playing Volleyball on the beach in southern California, playing laser tag with the whole family, it is not the STUFF we remember. When you do shop, please consider shopping at local, independently owned shops.